“Once on This Island” is an enchanting musical fable written by the Tony Award-winning team of Stephen Flaherty and Lynn Ahrens (“Ragtime,” “Seussical,” “Anastasia”). Derived from Hans Christian Andersen’s legend “The Little Mermaid,” the story explores the life-changing consequences of romance between people from two different worlds. Set on an island in the French Antilles, the play follows the journey of Ti Moune, a poor orphaned peasant girl who falls deeply in love with a rich city boy she rescues from death. Central to the story are four gods whom the peasants believe rule their destinies. The gods of Love (Erzulie), Earth (Asaka), Water (Agwe), and Death (Papa Ge) cause the lives of the young lovers to intersect, and send Ti Moune on the fateful quest that tests the strength of her love against the powerful forces of social prejudice, hatred and death. 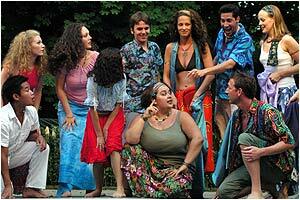 Nominated for eight Tony Awards in 1991 and winner of the 1995 Olivier Award for Best Musical, the show boasts a rousing calypso-flavored pop score that includes upbeat numbers such as “Some Say,” “Mama Will Provide,” and “Why We Tell the Story,” and poignant ballads such as “The Human Heart” and “Forever Yours.” Through a uniquely moving combination of dance, drama and song, “Once on This Island” celebrates the art of storytelling and its integral part in the fabric of cultural heritage. As one lyric describes it, "For out of what we live and we believe, our lives become the stories that we weave." 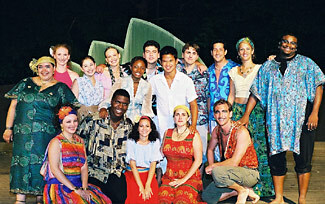 The Richter cast features Amber Whitmire of New Haven as the orphan TiMoune and Tiana Estrada of Waterbury as her younger incarnation; Andrew Wheelock of Brookfield as Daniel, the young man of privilege; Amy Calvo and Jon Michel, both of Waterbury, as Mama Euralie and TonTon Julian, TiMoune’s adoptive parents; and Bret Bisaillon of Waterbury as Armand, Daniel’s father. As the gods who oversee this mythical world, John Congdon of Fairfield portrays Papa Ge, the demon of death; Danielle Elliott of Waterbury is Erzulie, Goddess of Love; Kelvin Burroughs of New Haven is Agwe, God of Water; and Cidalia Alves of Danbury is Asaka, Mother of Earth. Amy Congdon of Fairfield portrays Daniel’s jealous fiancée, Andrea. Rounding out the ensemble in a variety of roles are Matt Blinstrubas and Guy Gaudiosi of Waterbury, Melanie Beck of Newtown, Kristen Jacobsen of Torrington and Louisa Tiberi of Bridgeport.